Just about everyone associates an auto injury with whiplash, but did you know that you could also have injuries to the thoracic and lumbar spine that are quite serious? One type of auto injury that is quite common is a spine injury, and it may occur in your midback (thoracic spine) and/or low back (lumbar spine). 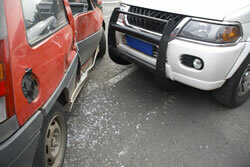 It was usually children or young adults who suffered from a flexion-distraction auto injury. Those who were 65 years old and overweight were the ones suffering from extension injuries. The worst type of auto injury was an extension injury, with a fatality rate of 24%, compared to other injuries that had a maximum fatality rate of 11%. If the injuries to the thoracic and lumbar spine were minor, the patients could still have major injuries, especially when they involved the abdomen and pelvis. This study also pointed out a difference in auto injuries between those who used a two-point belted seat belt versus a three-point belted seat belt. Those who used three-point seat belts were three times more likely to have spinal fractures although these seat belts protected against neurological injury, fatality, and worse injuries. Those who used two-point belted seat belts had flexion-distraction injuries most of the time. Who had the highest risk of developing spinal fractures and dislocations in the thoracic and lumbar spine? It was those who didn’t wear a seat belt at all. The good news is that spinal fractures are like other fractures in the body; you will heal from them if you have the right nutrition. Ask your chiropractor about the best diet and supplements to heal your body from your auto injury.